Honda started collaborating with Saitama’s prefecture in December 2010. Here’s what they achieved, a solar hydrogen station. Or a tool to fill up a car with renewable clean energy. This is a true zero CO2 emission system, sized to produce 1.5kg of hydrogen each 24 hours. Solar panels (not shown) are at the base of the system. They send electrical energy to a Honda-designed water electrolysis system, which is so smart that it delivers hydrogen at precisely the same high pressure the tank requires. This avoids extra energy consumption for pressurizing hydrogen. 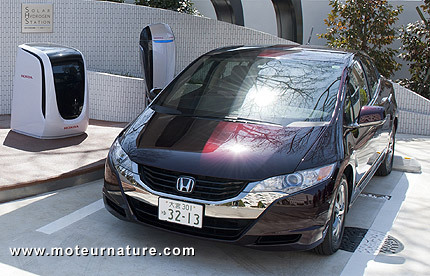 The car, a Honda FCX Clarity, needs one kg of hydrogen to drive 100 km (62 miles). This gives the driver a choice of 93 miles of driving each day, or about 275 miles every 3 days. Another asset from the lack of a compressor is that the whole system is perfectly silent, but Honda made it even better with the added function of a mobile electric generator. When stationary, the car’s fuel cell can function as a 9 kW power source. This will be most useful in Japan, where the electrical grid has shown several deficiencies since the Fukushima disaster. So that’s the future according to Honda, but a lot remains to be done to lower the price of these new technologies.